With the overflow of excitement and the mountain of planning to do, some brides wait until the very last minute to choose a makeup artist for their wedding day and, in a cost-saving effort, some brides even forgo hiring a makeup artist for their special day, deeming it an unnecessary added expense. We’re here to tell you that hiring a professional makeup artist is integral to your wedding because how you look on your big day will be captured and immortalised in wedding photos and videos forever. While your makeup skill may be passable for an everyday look, wedding makeup artists come armed with certain skills and techniques to make sure your makeup lasts all day and well into the night. Hiring a makeup artist may seem like an unnecessary expense, but trust us when we say – it is not. It is one of the biggest decisions you will make as a bride and will involve a sizeable chunk of your time with the research and trials. As the old adage goes, when you look good, you feel good. No bride wants their makeup melting off their face in the middle of a reception dinner, nor do they want super shiny skin in photos. If you choose the right makeup artist, they will be equipped with top-quality makeup products that will prevent any makeup disasters. The Gold Coast is blessed with plenty of makeup artists to choose form, but you want someone with a stunning portfolio and a lot of wedding makeup experience. Check out their website, browse through their portfolio and be sure to book a trial run. This trial session allows them to analyse your skin type and be prepared with the right products to suit your skin’s need. But before any makeup trials happen, it’s important for your skin to be the best it can be and so a skincare regime should be your first stop. Your makeup artist may be able to advise on the best path forward or point you in the right direction. Many wedding makeup artists also take care of your hair and can create an elegant and timeless look to accentuate your best features – no matter what your style is. Booking a professional makeup artist will take a lot of stress off your shoulders for your special day because you can go on with full confidence that you will look your best. Just make sure you book ahead with plenty of time to spare. Your personal makeup artist will make sure they create your desired look, starting right from the trial, to your “I dos” and all the way the end of the night. 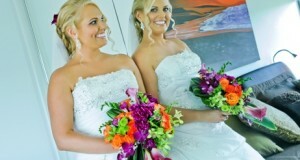 But here’s why you should consider a mobile wedding makeup artist to make your dreams come true. • They come straight to your door (wherever you are; at home or a hotel). 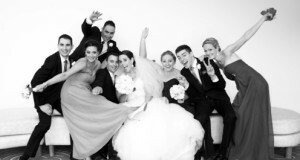 • Can look after everyone, including the mother of the bride, bridesmaids, mother in law and special guests. • A mobile makeup artist cuts out your travel time. • You can have a more leisurely time getting ready. • Helps make your day so much easier and less stressful. • Start your wedding day off on the right foot and feeling relaxed. Using a palette of browns and golds, this look is one chosen by brides everywhere because it is elegant and classic. It’s a stand out because it will make your natural complexion just look even better. Minimise colour with only a hint of it on your cheeks and eyes, and keep lips fresh with a light pink-brown tone. Draw attention to your perfect pout with a gorgeous smack of pink or red to your lips. Reds and pinks are popular choices for a statement-making mouth. Keep the rest of your look simple by adding a brown colour to your eyelid and focusing on big lashes. Keep eyes simple and not too bold. It’s one or the other. Want to show off your almond-shaped peepers? Do so with a bold eye. It can be a smoky eye or a beautiful metallic shadow paired with a thick luscious lick of dark eyeliner. We’re loving emerald, purple and navy at the moment. Try winged eyeliner for added glamour and keep lips light. Different from the natural look, the minimalist look is very simple in its execution. It sticks to contouring, bold brows, thick lashes and a simple clear gloss on your lips, and that’s about it. There’s not a lot to this look, but it still packs a powerful punch. This is such a sweet look for spring and takes in the beautiful pink palette of the season. Think rosy pink cheeks, a light eye shadow and gorgeous glossy light pink lips. It’s natural with a hint of English rose. Whatever your preferred look, you will already be the star of your wedding day and armed with these tips you will shine brighter than ever. Ultimately, it’s your day to dream and have everything you want, including a special look.